Few, if any other four-door vehicle looks as good as the gorgeous, all-new Rapide. Aston Martin wanted a four-door sports sedan that would not compromise any of the sporty DNA of the legendary 12 cylinder coupés that Aston Martin is known for… The energetic and affable chief designer Marek Reichman inspired a collaborative team of designers and engineers who set out to capture this exact essence in a four-door model. Mr. Reicham succeeded in spades with the 2011 Rapide. This is certainly not the first time Aston Martin does a four-door, nor is it the first time we have seen the name Rapide. There was the frumpy-looking Lagonda Rapide from 1961-64, as well as the limited production, over-the-top, four-door Lagonda, produced from 1977-89. Why the Rapide and why now? Well, current Vantage and DB9 owners wanted the marque to offer a four-door car, as some of these well-heeled owners missed having a “saloon” to use as a daily, family vehicle. 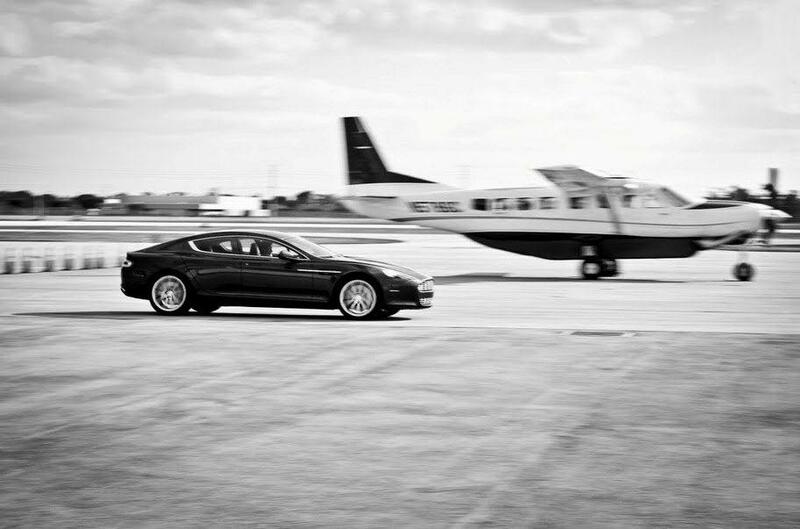 It’s hard to take your eyes off the Rapide, even for a second. Every line, curve, and angle is perfectly proportioned. The front is all Aston, as it shares an almost identical look with the DB9 coupé. Although this model has tremendous presence, it never feels pretentious or overpowering, as is the case with some other high-end sedans. The Rapide’s impressive profile leaves no doubt that this is a rolling masterpiece of automotive design. Even though Aston Martin is the third luxury vehicle manufacturer to come up with a four-door coupe (Mercedes-Benz pioneered with the CLS, and Porsche came later with the Panamera), Aston Martin’s entry is clearly the most beautiful of the three. The Rapide’s rear doors are perfect in dimension and shape, while the roof-line’s elegant angle and slope make a dramatic statement. Additionally, rear door to C pillar transition is design-inspiring for a sedan. In fact, the Rapide does not give up any of the fabulous beauty the 2006 prototype Aston Martin teased us with at the 2006 Geneva Motor Show. This is quite interesting, as it is rare to get a production car to look as good as a concept vehicle. The Aston Martin design team pulled it off with an almost identical production version, save for a few elements that did not carry over; namely, the tinted glass roof, front fender, headlight treatment and show-car side mirrors. Looking at the Rapide head-on, one instantly notices its show-stopping headlights, which are elegantly proportioned, giving the front fascia of the Rapide a shark-like demeanor. Angled rows of yellow LED lights make up the turn signals, and house the high/low beam projectors. You will find engine cooling ducts bisected by elegant bright trim as well as side marker LED turn signal lights along the front fenders. The rear has simple, yet elegant taillights in addition to dual exhaust tips on each corner of the bumper. Bamboo, Tamo Ash, Double Apex Alloy, Nexus Alloy as well as Walnut. 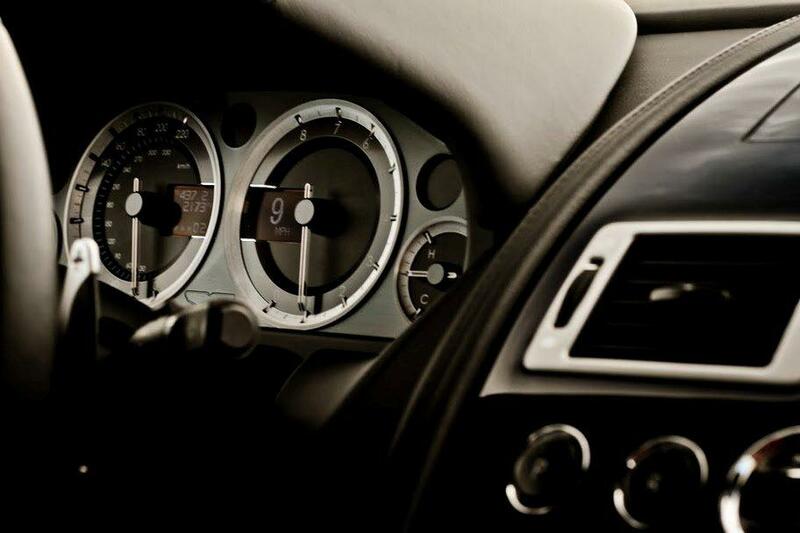 Our marvelous test Rapide had the optional and dramatic high-gloss piano black veneer finish. Cockpit instrumentation is all Aston Martin, with a fabulously lit white hue that bathes the main instruments as well as the back-lit controls. Throughout the interior, all comfort and reading lights are LED, offering a magical glow when these are turned on. There is a vendor-sourced navigation system that, frankly, is the cars’ weakest point. The system is difficult to understand, read and operate. For sound, there is a Bang & Olufsen Beosound audio, as well as an optional rear seat entertainment system with headsets and remote control. Front seats are sporty yet surprisingly comfortable. There is a large center console that offers minimal storage space, as well as iPod/iPhone and cigar lighter plugs. Rear seats are similar in comfort, and enjoy individual ventilation controls as well as a storage area between the seats. I was surprised at the level of comfort the back seats offer, especially with the large center console. Leg room is adequate, as long as those seated in front do not slide the seats all the way back. Rear seat-backs fold down completely, offering a large cargo area for those unlikely trips to Home Depot. Hatchback cargo area is equally well appointed, with multi-compartments that fold down as well as the location for the DVD system. There is an elegant leather pull-down lanyard for closing the boot, as well as a convenient LED light on the hatch itself. Starting the Rapide is a highly anticipated event, even more so enhanced by its gorgeous and unique key. Stick the crystal fascia key in the “Emotion Control Unit” and simply press, instantly, there is a split second series of events. It begins when you see the back light change from white to red, is immediately followed by the exotic sound of the high speed whine of the starter, and reaches its magnificent zenith when the glorious cacophony of the 12 cylinder engine exhaust rumbles. Desired gear is selected by the touch of a button on the center dash. Acceleration is brisk, yet not coif-ruffling, with an added bonus. At 3,500 RPM’s the exhaust butterfly-valves open up and out comes a crescendo of exhaust sound that is simply titillating. Cornering is surprisingly nimble and neutral, thanks in part to the fabulous suspension set-up, while the steering feedback is as precise as a surgeons’ scalpel. Brake and throttle pedals have the right amount of feel, offering a wonderful sensation to the driver every time they are used. Switchgear and controls are perfect to the touch, like a Savile-Row bespoke suit. Our short stint with the Rapide ended too quickly, I had a hard time giving back the key. Why buy a work of art that you can hang on a wall, or display on a stand… when you can use your rolling work of art to go from 0 to 60 MPH in 5.0 seconds? The Aston Martin Rapide, the most beautiful four-door sedan in the world. Popular Options: Rear seat entertainment, Cooled front and rear seats, Piano black veneer.